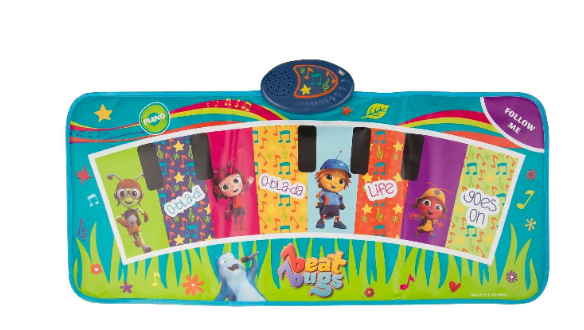 Today, I wanted to introduce you all to the new Beat Bugs toy line exclusively at Target. If you have been to Target lately and visited the toy aisle, then you might have seen these fun new toys. We had to make a special trip the other day so that Savannah could spend her birthday money and Bella had cracked open her piggy bank and took out all her coins and dollars, which she had been saving for Disney, so that she could buy a couple of the Beat Bugs toys she saw online. I still can't believe how tech savvy kids are nowadays. And, once they learn how to spell and read, you really have to watch them. I can't tell you how many times I pass the iPad or my phone over to the girls and they do a search for their favorite shows or characters. This is how Bella found out about the new Beat Bugs toy line last month before I did. And, ever since then she has been asking me to keep an eye out for them, so she could get some. So, when I was asked a couple weeks ago if I wanted to get a sneak peek of the new toys, and share a review of a couple of the new toys, I jumped at the opportunity as I knew Bella would be so excited when she saw the toys arrive at our doorstep and would do a great job in helping me review them...and, that she did, along with the help of Savannah. You can check out the entire Beat Bugs toy line at Target by visiting -- http://beatbugs.toys/DreamTeam. Here you will see plush toys, figure sets, musical instruments and more. We were sent the Beat Bugs Piano Music Mat and the a Matching Game from WonderForge. The girls couldn't wait for me to put batteries into the piano mat to give it a go. This piano music mat comes pre-programmed with 2 Beat Bugs tunes -- "All You Need is Love" and "Yellow Submarine." You also have 2 game modes -- solo piano or follow me game. Once I had the batteries in, the girls went to town trying out the two game modes, and signing along to these popular Beatles song. I have been a fan of the Beatles since I was little, and used to play their music as lullabies for the girls when they were babies. Never did I imagine that my 5.5 and now 7 year old daughters would be fans of the Beatles and be singing all their hits. But, thanks to this new animated series, they not only get to watch a fun and educational show, but are also being introduced to Beatles music, sung by popular music artists of today including P!nk and Eddie Vedder. Bella has been signing "Lucy in the Sky with Diamonds" and "Help non-stop and now has these songs stuck in my head, too. So, if you have a Beat Bugs fan in your life, and you haven't already visited your local Target store or shopped online or Beat Bugs toys, you will want to check them out soon. We went last week and I had to go back to the store today and found the toys were picked over. They will definitely be a hot toy this holiday season and once everyone knows that toys from this hit animated series streaming on Netflix are now available at Target. I never heard of them before,but their so cute! I'm sure when my grand daughter gets older,she'll probably be in to them! She's only (1) right now,so I know she'll change so many times,about what is her favorite!